Amar Bhidé: The least of the problems is the money that's wasted on techno-nationalists' prescriptions. I see a bigger issue – techno-nationalism is a descendant of xenophobic mercantilism. The old mercantilists asserted that trade surpluses were good and trade deficits were bad. But what good did trade surpluses do? You simply accumulated “specie”, basically gold or silver which had no economic value. Pursuing a technological lead is the modern version of trying to accumulate specie and reflects that same mercantilist, xenophobic mindset that could easily transmute into old-fashioned protectionism. This would be really unfortunate – even more unfortunate than techno-nationalism. A second problem with techno-nationalism is it distracts attention from much more important issues. The much bigger issues – at least in the United States – are domestic ones. In the introduction to my book I said that the financial system was in truly rough shape, and I wrote the introduction about three years ago. Although problems of the financial system may have some global ramifications, they are principally the consequence of bad domestic regulation. If, instead of worrying about whether the U.S. would lose its technological lead to China or India, we had paid more attention to our financial system, serious problems might have been averted. Similarly, techno-nationalism is also a distraction from attending to the problems of healthcare, and the K-12 educational system that, in many parts of the United States, is really broken. It’s the age-old issue of people being able to focus on only a few things at a time – so it's really important to focus on the important things. VB: The techno-nationalist perspective would have the U.S. set a high priority on educating scientists and engineers in order to encourage high-level research and innovation? Amar Bhidé: If you say let’s train more scientists and engineers it begs the question “who are we going to train less of?” I don’t know that anybody is smart enough, in this "multi-player innovation game", to know the right mix of occupations. And why would you drag people out of one occupation and put them into another on the basis of a dubious theory? I was speaking about my book once, and someone reproached me: “You haven’t said anything about industrial design”. I replied "Yes, I’m sorry, I didn’t say anything about it but it makes my point, which is that industrial design is another important occupation in the overall picture of innovation." For us to think we should train more scientists and engineers, and therefore have fewer industrial designers, managers, or fewer bank regulators – why is that a sensible choice? VB: That type of decision would set directions in the economy, wouldn’t it? Amar Bhidé: Yes. Sometimes it's important to set directions in the economy. For example, levying a carbon tax to deal with global warming would be a good way of setting a direction. That problem is so important, that it's worth setting a direction. But in general, it's very hard to say how much high-level science and high-level engineering society should subsidize. High-level science is a public good that might be under-supplied if it's not subsidized. But the question is how much? Progress requires many levels and kinds of knowledge. We certainly don’t want to devote all our resources to the production of high-level science, leaving no resources or people available to exploit this knowledge. My argument is that no matter what the right level of subsidy is, the amount does not increase because more of science is being produced in China and India. VB: I gather the world is often flat for high-level innovations – the innovations travel relatively easily. However, for many mid- and ground-level innovations the world is not flat. What is the implication of your observation that the world isn't flat to the same degree for all kinds of innovations? Amar Bhidé: High-level knowledge, such as scientific research in universities, is widely shared. Even patents can be licensed for use by many companies. As the production of scientific and other high-level knowledge from places such as China and India increases, this highly mobile knowledge can be used for mid- and ground-level innovations anywhere. But these lower-level innovations are less mobile, because they have to be adapted to local tastes, conditions and cultures, and therefore have to be developed in the places where they are used. We can’t rely on innovators based outside the U.S. to develop them for us, whereas we can with high-level scientific and technological breakthroughs. Locally developed mid- and ground-level innovations in the service sector are particularly important for our long-run prosperity. The service sector accounts for about seventy percent of the Gross Domestic Product in the United States, and it has grown from fifty-four percent in 1974. VB: High-level innovators can work in "splendid isolation". However, the essence of modern innovation in the mid- and ground-levels is like "the chef who has 'little idea of what diners would like [and] experiments on his customers.'" And the chef's customers "are active rather than unwitting or passive participants in the experiments – they make suggestions, possibly even in the kitchen as the dish is being cooked." Would you comment? Amar Bhidé: Mid- and ground-level innovations are usually optimized to meet local customers' needs, although there are exceptions – some consumer products are fairly universal. And this optimization is hard to do without an on-going dialog with users, and a lot of trial and error by users, because often users themselves don’t know what they want in advance. VB: Would you talk about the different types of intellectual property that are generally the result of these three levels of innovation? Amar Bhidé: There isn’t a clear mapping of the kinds of intellectual property and levels of innovation. But you can roughly say that the highest levels of scientific knowledge are a public good – they are published in journals and are nobody’s property. They belong to mankind. If you put aside scientific knowledge and focus on technologies developed for commercial use, as a rule it's easier to patent high-level know-how because it is more compact, less rooted in specific conditions, and can be described more easily. In contrast a lot of lower-level knowledge is tacit and difficult to put down on paper. VB: And therefore difficult to patent. Amar Bhidé: Yes, definitely difficult to patent. One of the basic requirements of a patent is that you must be able to describe what the invention is, and how it is supposed to work. This is impossible to do with tacit know-how. With ground-level know-how that is developed for specific, highly idiosyncratic conditions, there is another issue as well. It doesn’t have much value to anybody else. The spreadsheet models I have developed for my personal use have value just to me. VB: Therefore there’s no point in even thinking about protecting that type of intellectual property. Amar Bhidé: It would be pointless and an unnecessary cost. VB: Other than for drugs and medical devices, is it a rule of thumb that for ground-level and mid-level innovations companies should consider relying on trade secret and copyright laws rather than registering patents? Amar Bhidé: I think with important exceptions, the answer is yes, for the same reasons – the difficulty of meeting the test for registering a patent. VB: You conclude that the U.S. is not locked into a zero-sum race for scientific and technological leadership, and that growth of cutting-edge research in China and India, and presumably in any other country, doesn't threaten U.S. prosperity. On the contrary, you argue that the country of origin of new ideas is inconsequential. You even go so far as to make a case "…for the benefit that will accrue to the United States from the erosion of its lead in cutting-edge science and technology." Would you explain? Amar Bhidé: This is closely related to the ideas of mobility of high-level research, and the United States and other Western countries having well-designed systems for developing and using mid- and ground-level know-how. The development of more high-level know-how in China and India provides more inputs for these systems therefore adds to prosperity in developed countries. In fact, countries with great systems for lower level innovations can derive more benefit even for high level breakthroughs that originate somewhere else. To give you a specific example, the Web was invented in Switzerland by a British scientist – as I mentioned in my book. The United States has probably derived far more economic value from the invention than Switzerland because U.S. innovators rapidly did all the downstream development necessary to use the Web, and individuals and businesses in the U.S. quickly embraced these innovations and tweaked them for their specific needs. VB: Is that because people in the United States are more innovative or have more available capital? Amar Bhidé: I think it is because we are enthusiastic about embracing technology, and this enthusiasm isn’t limited to just a few technology areas. American society as a whole quickly picks up on new technologies. Also, we don’t have many of the regulations that exist in other countries that make it difficult to embrace new technologies. This is not universally true&,dash;there are arenas where bad regulatory structures make America less capable of taking advantage of technological advances. Our banking and payment system is primitive compared to Europe. Consequently the U.S. hasn't been able to take advantage of e-banking to the same extent as some European countries. VB: Of course we now know some of the consequences of the less-regulated banking system in the United States. Amar Bhidé: I’ve written a long article on this subject, posted on my website. An unregulated banking system won’t work in a modern, free market economy. But regulating it properly is tricky. This goes back to my original point about the problem with techno-nationalism – it diverts attention from those public policy problems, such as regulating the financial system, that are crucial. Let’s focus our attention on fixing those problems and forget about other less important stuff. VB: So America doesn't need a national call to action, comparable to the Kennedy challenge to be the first to put a person on the moon – a call for increased high-level or pure research, and acceleration of the number of American youth graduating as scientists and engineers? Amar Bhidé: No, but it probably needs a call to action to improve the overall level of education, especially amongst the disadvantaged. I’m certainly not advocating cutbacks, but I don’t see why there should be a call to action for increased high-level or pure research. I was at a meeting of the Council on Foreign Relations three or four weeks ago. A distinguished committee made a compelling argument for funding an increase in the number of diplomats who speak and have knowledge of foreign languages. They pointed out that not having diplomats who speak Arabic can have enormous economic consequences. Amar Bhidé: And political consequences. So why isn’t that more urgent that increasing budgets for science? There is similarly a shortage of nurses. There are shortages of so many things that should receive more attention, and public funding. Particularly now that the rest of the world is very happy to supply us – for better or for worse – with scientists and engineers. It's also interesting to see how many people working on Wall Street have PhDs in science and engineering. Simply training more scientists and engineers doesn’t necessarily mean that they will end up working as scientists and engineers. VB: They will go where money can be made. Amar Bhidé: They will go where the money is, yes. VB: So in some respects the market economy will actually adjust how many scientists and engineers need to be trained. Amar Bhidé: It doesn’t do it perfectly or instantaneously. I am not claiming there is a perfect frictionless market. But I think there’s no compelling argument that we should go out of our way to train more scientists and engineers. VB: You say richer countries are not wealthier because they are significant developers of break-through technologies but because of their capacity to benefit from innovations that originated elsewhere. Was this also true prior to globalization? Amar Bhidé: High-level technologies and know-how have always been more mobile. What has happened because of the Internet and other communication systems is that they have become a little more mobile, but that’s about it. Even prior to what we now consider globalization, technologies always traveled. Places that were capable of exploiting those technologies benefited and places that were less capable didn’t. Think of the electrical revolution. Some of the basic breakthroughs in the laws of electricity occurred in the United Kingdom. But that didn’t mean that the UK got any greater benefit from these breakthroughs than did Germany or France. The biggest beneficiaries of the electrical revolution were the countries that were able to set up the infrastructure and use electricity. Even the locations where various types of electrical generating equipment were invented was a very minor factor. What really mattered was who was able to use electricity widely. Some parts of the world electrified quickly, and other parts did not. New Mexico became more prosperous by virtue of the electrical revolution than did Mexico, not because Edison was working in New Jersey – he could have developed the light bulb anywhere. It was because the U.S. had a commercial and regulatory system that allowed rapid establishment of electrical utilities in places like New Mexico. VB: Regulatory systems. They sound like a very important factor in the adoption of innovations. Amar Bhidé: Yes, one of the arguments I make at the end of the book is that as the world becomes more technologically advanced, the optimal level of rules increases. When you invent automobiles you need rules of the road. When you invent radio or television you need an FCC to say you can broadcast on these frequencies and not on those frequencies. In a primitive agrarian society you don’t need much regulation. As economies become more advanced getting the right balance of not too much and not too little regulation becomes really important. VB: For your book you studied one hundred and six venture capital-based businesses because they are "pure innovators". Would you explain what you mean by pure innovators? Amar Bhidé: Large companies develop new products, services and technologies, but they also have a large business selling existing products. In contrast, venture capital-based companies are just focused on developing new products. Therefore, what you observe in venture capital-based businesses is not muddied by other things that are going on. That doesn’t mean they are or are not ‘better’ innovators. VB: What is venturesome consumption? Amar Bhidé: It's the willingness and ability of intermediate producers and consumers to take a chance on and effectively use new products and know-how. VB: What does it mean when you say consumers bear "unmeasurable and unquantifiable" risks? Amar Bhidé: It's long been known that leading edge users play an important role in innovation. That’s not a new insight. I think what’s relatively novel in my argument is that it’s not just the handful of early adopters of leading edger users who play an important role – it's almost everyone. Anyone who buys a new flat panel TV to replace an old TV set is taking what Frank Knight, the great Chicago economist would call an “unmeasurable and unquantifiable risk," because the buyer can’t quantify the value the new television set is going to provide compared to its price. VB: Venturesome consumption would especially apply to consumers of mass products. Amar Bhidé: If you added up all the risks taken by Microsoft in developing a new generation of office products, it would likely be in the order of a few billion dollars. If you could somehow quantify all the risks taken by the fifty to one hundred million users of these products, I suspect it would dwarf the risks taken by Microsoft. Without the risks taken by its consumers there would be no innovation by Microsoft. But its not just purchasers of consumer products. Even businesses, whether or not they are leading edge, take unmeasurable and unquantifiable risks. An organization that buys a multi-million dollar enterprise software package can’t know whether the benefits are going to be worth the cost. First off, it’s incredibly hard to know what the all-in costs are. Second, it's even harder to know and measure the benefits. And it’s almost impossible to anticipate all the things that could go wrong during the implementation and ongoing operation of the enterprise software. VB: You talk about the value of sales and marketing in realizing the value of innovations because few new products sell themselves – the innovator has to give information about features and modes of use to prospective buyers. And you observe that a company doing more R & D and less marketing may reduce consumer surplus, which is the value to consumers in excess of the price paid, to a greater degree than it increases the benefits of technical knowledge. Would you explain? Amar Bhidé: Let’s think of a computer. IBM has scientists in its R & D labs designing new computers. But someone also has to sell these products. Because of the unmeasurable and unquantifiable risks to potential buyers, IBM can't merely assume it can drop a box containing the new products in front of consumers or businesses and say 'here, take a chance on it." Somebody has to persuade customers. Now when consumers buy a new product their surplus tends to be greater than the price paid – otherwise why would they buy it? Suspend disbelief for a minute and imagine that IBM could move all of its sales people into its R & D and develop twice as many new products. But IBM wouldn’t be able to sell these products if it had no sales staff. This would also reduce the total consumer surplus. Obviously the people who do sales and marketing are generally not the people who do R & D. My point is that innovation is of no value without use by consumers and businesses, and this requires sales and marketing. VB: Might it be argued that wealthier countries like the United States offer significant contributions toward innovation because they focus heavily on sales and marketing? Amar Bhidé: Absolutely. I once attended a seminar by a brilliant developmental economist who studied why farmers in Africa did not use fertilizer even though they had information about its benefits and incentives to do so. The researchers did controlled experiments, but the farmers still did not use fertilizer. I spoke with the economist after the seminar and said, "Did it occur to you that any new innovation – even fertilizer – has to be sold to farmers?” Unfortunately, sales and marketing is an important function that often doesn’t show up in any standard economic theories. Fortunately, people in the real world get it. The effort companies that I studied put into sales and marketing was as at least as significant as the effort they put into developing their products. VB: You say many innovations do not displace existing products and services – they create and satisfy new wants. These nondestructive innovations of tangible products and value-added services are the primary causes of economic growth and job creation. You speculate that as long as new wants continue the number of jobs created will replace the jobs innovation takes away through efficiency improvements and offshoring – "unless the enterprise as a whole falls on hard times". Given that the enterprise now appears to be on hard times, is it possible we are heading toward a zero-sum situation between the rich and poor countries for technological innovations? Amar Bhidé: I think we’d have to fall on really hard times before this process of nondestructive innovation stops propelling economic growth. I don’t think we’re anywhere near that point – yet. VB: And we hope we don’t get there. Amar Bhidé: And we hope we don’t get there. The interesting thing is that even in the Great Depression the adoption of new technologies remained robust. Now, for instance, people may stop buying more expensive homes, but basic human urges don’t change even in hard times. So instead of the four hundred thousand dollar houses, consumers might buy gizmos like iPhones, Netbooks, Kindles and who knows what other innovations. VB: And we’re not likely to want to go back to just using a normal telephone anymore. We’ll continue to adopt new products and know-how. Amar Bhidé: Yes, there's no doubt about it. VB: You say excessive thrift can injure capitalism. Overall United States consumers "lead the pack" in spending and borrowing, and taking chances on unproven innovations. Should we be concerned if, as a result of the current financial crisis, consumers become savers, cautious spenders, and cautious users of credit--as occurred among those who had experienced the Great Depression? Amar Bhidé: A cutback in total consumption doesn’t necessarily have to involve a cutback in venturesome consumption. Like I said earlier, while there was a cutback in the total of consumption in the Great Depression, people continued adopting new technologies. This continued adoption of new technologies also occurred in the early 1980s when we were in, I think, a more serious recession than we are now. That was when the personal computer took off. People were willing to take a chance on buying personal computers even though they were far more expensive than they are now. I remember buying my first personal computer for ten thousand dollars in 1981 or 1982. It was a quarter of my salary at the time. VB: "Offshoring is not a threat to U.S. prosperity." Why not? Amar Bhidé: Offshoring is not a threat for the same reason that free trade is not a threat to U.S. prosperity. Offshoring is simply a version of free trade. It can threaten the livelihoods and wealth of some individuals. But, there's no reason to believe that, in the aggregate, offshoring will hurt the U.S.
VB: This is one area where there are a lot of misunderstandings, and where emotion plays a significant role in public policy and decision-making. Amar Bhidé: Yes, I also suspect there’s a bit of a class issue in America. Free trade has generally been considered to be good, but it primarily affected blue collar workers. Now there’s the possibility that offshoring could affect us, which causes a great deal more concern. VB: Who are the “us” you refer to? Amar Bhidé: The “us” are the people who read and write newspapers and magazines, the more educated, and the better paid. We were willing to take a benign view of free trade. We feel much more threatened by offshoring. VB: You quote Edward Learner as saying in his 2004 article "Who's Afraid of Global Trade" that only 17.5 percent of the U.S.'s Gross Domestic Product was globally "contestable", which is to say exposed to competition from imports. Because the major growth in the economy since then has been in the service sector it appears that globalization will not have a major negative impact on businesses providing mid- and ground-level innovation. Is that true? Amar Bhidé: I think it could actually have a positive effect. For instance, technology has played an important role in improving the productivity of these uncontested sectors. As the cost of technologies goes down because of globalization, adoption of these technologies in uncontested sectors increases – making those sectors more productive. Second, even in uncontested sectors there are valuable high-level ideas, which can flow from place to place. Consider hospital care – an obviously uncontested service which is produced and consumed locally. The idea of washing your hands before you operate on patients is thought to be the single most important breakthrough in modern medicine. That idea didn’t originate in the U.S., but we benefited after it was adopted by our hospitals. VB: Would this example be different if the idea of washing your hands before surgery was covered by a patent? Amar Bhidé: Even if somebody had patented it, the amounts that hospitals would pay for such a patent would be trivial compared to the value of the results. Suppose hospitals had to give half a nickel for the idea of surgeons washing their hands for fifteen years. That’s a pittance compared to the value of the lives saved. VB: I gather you have concluded most manufacturing activities could be outsourced and presumably offshored. What does this say about the future of the North American automobile industry or other major manufacturing activities? Is offshoring inevitable? Amar Bhidé: No. Things which can be offshored are not necessarily the most economic to offshore. There are many advantages to producing things close to where they are consumed. You have lower transportation costs, a shorter supply chain, and you can be more responsive to changes in consumer needs. In the automobile industry Japanese companies are increasingly producing cars in the United States: It is cheaper to ship cars from Tennessee to dealers in the U.S. than from Japan. As China develops, it is quite possible some manufacturing will come back to the U.S. – clothes, for instance. We grow cotton in the U.S., it gets shipped to China, it's spun and turned into shirts, and then shipped back to the U.S. This makes sense only to the extent that China is a poorer, less developed country. As it becomes more developed there will be a push to return manufacturing to the U. S. The fact that something could be offshored doesn’t necessarily mean it will be offshored. These things are hard to predict. Actually there has not been a significant decline in manufacturing output over the last thirty years in the U.S. A decline in manufacturing jobs, but not in manufactured products. VB: Innovation, including automation and mechanization, has been the cause of the reduction in the number of employees? Amar Bhidé: Yes, but who knows the future? Domestic manufacturing could take off for instance, if a technological breakthrough drastically reduced the costs of custom building things locally. VB: Most of the CEOs of venture capital-funded businesses you interviewed indicated they felt software or other products could not easily be developed by virtual teams or by sending the development offshore. Some of the reasons they gave were the difficulty of coordinating a team in "real time", the need for intense interaction among those working on product development, time constraints, managerial capacity of offshore firms, skills of the developers, limited savings potential and cultural differences. Is it also likely that the CEOs' discomfort has to do with their companies' lack of experience in managing virtual teams? Amar Bhidé: I don’t thinks so. Even people who had prior experience with virtual teams didn't use them. VB: On the other hand, you observe that, although in the past many companies' innovation activities were jealously guarded in a R&D department, companies in the West have recently started to spread the load of R&D to external organizations. Is this trend likely to accelerate as companies endeavor to reduce fixed costs in response to financial pressures, and if so, is it likely that innovation outcomes will improve with increasingly diverse teams of people from all over the world working together on business problems and product development? Amar Bhidé: I don’t know. Companies have always relied on each other. In the very old days when IBM and AT&T were vertically integrated monopolies they had a strong tendency to do things in-house. But it wasn’t the case that every business in the U.S. was a vertically integrated monopoly. IBM and AT&T have most certainly increased their reliance on external technologies. But I’m not sure it’s a huge trend economy-wide. At any rate, I have not seen any compelling data to suggest this is the case. VB: Given what you learned in your research about venture capital- backed companies, if you were starting up a company would you seek financing from venture capitalists? If so, under what circumstances? Amar Bhidé has been studying entrepreneurship for twenty years. He earned a DBA (1988) and an MBA with high distinction as a Baker Scholar (1979) from Harvard. He received a B.Tech from the Indian Institute of Technology in 1977. 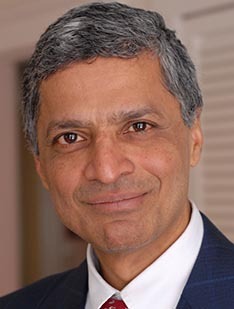 Bhidé is the Lawrence D. Glaubinger Professor of Business at Columbia University. Previously he served on the faculties of Harvard Business School (from 1988 to 2000) and the University of Chicago's Graduate School of Business. A former Senior Engagement Manager at McKinsey & Company and Vice President at E.F. Hutton, Bhidé served on the staff of the Presidential Task Force on Market Mechanisms which investigated the 1987 stock market crash. Bhidé is the author of The Venturesome Economy: How Innovation Sustains Prosperity in a More Connected World, (Princeton University Press 2008), The Origin and Evolution of New Businesses (Oxford 2000), and Of Politics and Economic Reality (Basic Books: 1984). He has published many articles in the areas of entrepreneurship, strategy, financial markets, and firm governance including Harvard Business Review, Journal of Financial Economics, Journal of Applied Corporate Finance, Wall Street Journal, New York Times, and Los Angeles Times.